What do your food habits say about you? I recently read an unscientific but altogether amusing article written by Phil Mutz that assessed what people’s eating habits revealed about their personality. Slow eaters, for example, supposedly make the most out of each and every moment, believe in completing a task well rather than quickly, and are often set in their routines. Fast eaters, on the other hand, are said to be good multi-taskers, have a healthy sense of competition, and often put the needs of others before their own. Mixers—those who like to get a little piece of everything in each bite—are reportedly outgoing, have strong relationships, and like to take on responsibility. With so many things on their plate (pun intended), however, they may over-commit. The “Isolationist” is evidently one of the more unusual eating styles and describes a methodical pattern of eating one food item at a time. Isolationists are detail-oriented, cautious, and always think things through. I brought up my “findings” at dinner that night, which was revealing in other ways. My younger son and husband like to keep their foods separate. I’m most definitely a mixer, while my older son said he eats each item before moving on to the next. In his nearly 20 years, I never knew this about him. The discussion led to questions about how people eat corn on the cob—typewriter-style, round and round, or haphazardly, for example—and what that says about their personalities. Or when there’s something you don’t like on your plate, do you get it over with right away or let it linger and choke it down at the end? Perhaps you were one of those kids who was required to sit at the dinner table with a plate of peas long after everyone else vacated? My husband offered that he’d be happy with a single item for dinner every night, like a bowl of rice. If we’d had this conversation years ago, I could have saved myself a lot of time in the kitchen! 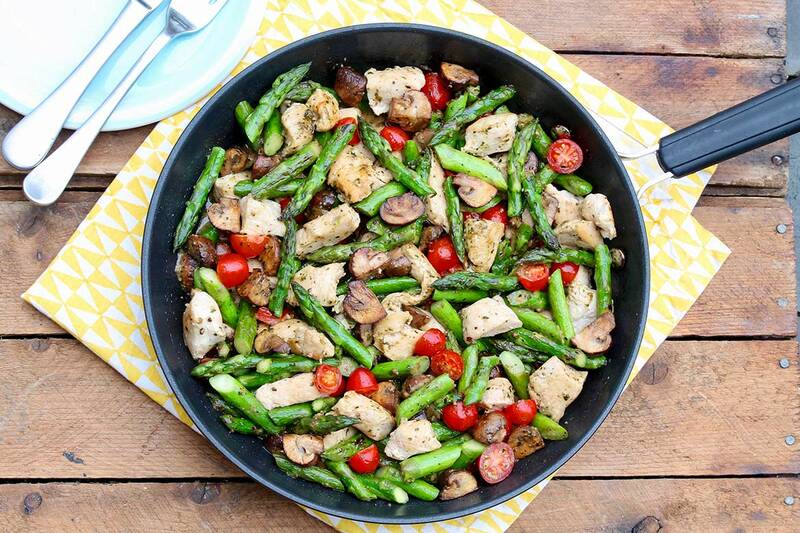 Rice or another grain of choice would be a complementary side for the following entree, which comes together quickly in one pan and incorporates a variety of seasonal vegetables and filling protein. 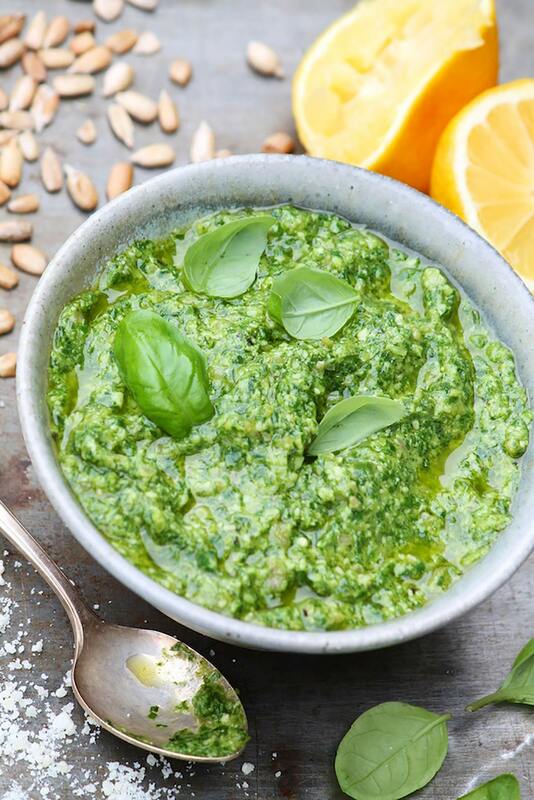 Pesto flavors the dish and is a perfect way to enjoy the seasonal bounty of basil, although store-bought pesto may certainly be used. As you sit down to your next meal, you may even consider whether you aim for a little piece of everything on each forkful or save all the mushrooms for last.  My hope is that you enjoy this easy dinner—and the amusing conversation it may inspire! It looks delicious! Great idea of using pesto on it! Sounds delicious. I still have some pesto in the freezer from my basil harvest in the fall. I also have fresh “baby” zucchini that I’ll substitute for the asparagus. My daughter saw this recipe in the newspaper on Sunday and wanted to make it. We had it tonight and it was delicious. The instructions were easy for a newer cook to follow, too. Thank you! How wonderful that she cooked for you, Mara. I’m thrilled the meal was a success! Bad news: We got rained out on the tennis court! 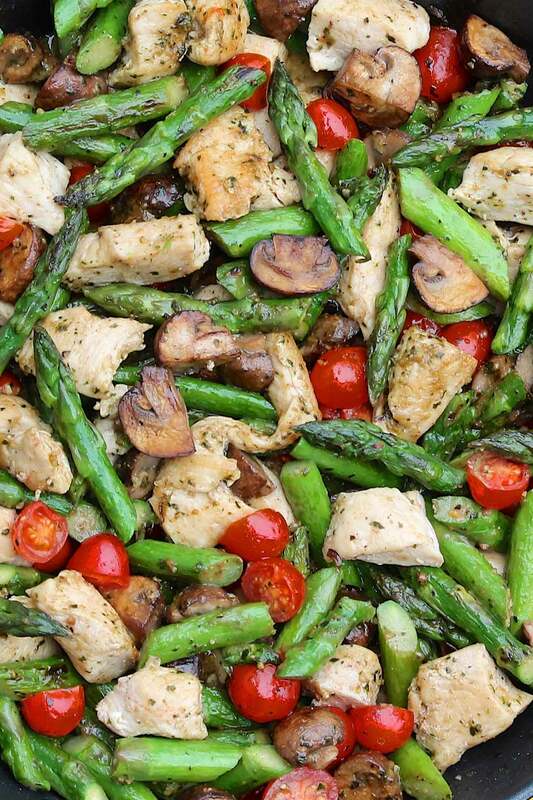 Good news: Loved the Chicken and Veggies w/ Pesto. I got lazy and bought Alessi pesto from the Herb Shop at Central Market. My husband liked your recipe so much, he went back for seconds (very unusual). Told me it’s a keeper! I’m sorry tennis got rained out but delighted the meal was a hit! Thanks so much for letting me know…and here’s to better tennis weather soon! I made this for dinner last night and it was delicious, it’s a keeper, thanks for sharing. Wonderful, Celeste! I’m delighted you enjoyed! Delicious! Your recipes aren’t complicated, and they’re tasty with excellent directions and tips. I’ll be keeping my eyes out for more good recipes from you! I’m delighted you think so and hope you find many more recipes to enjoy! This is so delicious. Thank you! I served penne pasta with it. I added pesto and Parmesan cheese to the pasts and returned to the stove to heat. Then I put the chicken mixture on top! Your pasta base sounds like a wonderful way to enjoy this dish. Thanks so much for mentioning, Joyce! 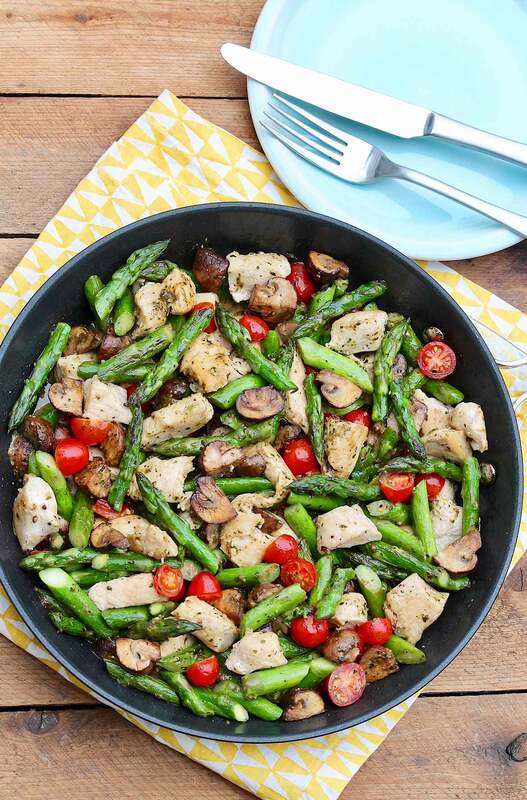 Hi Ann – had family here for dinner and they loved the chicken, asparagus, mushroom, etc. I used thighs and I added the tomatoes at the last minute so they would not be squishy, but otherwise followed your recipe exactly. Thanks so much. So happy you and your family enjoyed, Joan! I made this and then tossed with cooked malfada. It was yummy and I packed the leftovers for lunch! Tossing with the pasta sounds perfect, and leftovers for lunch are always a treat. Thanks for your comment, Sandi! 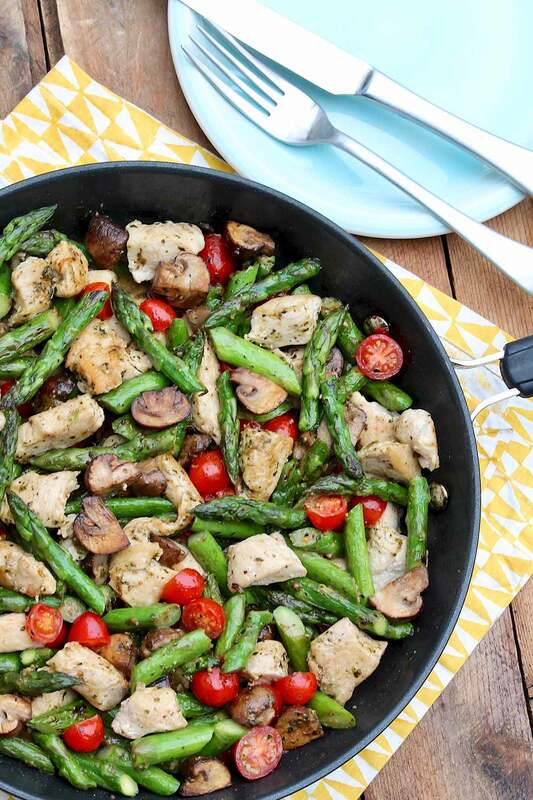 This is a perfect spring/summer meal! Served over yellow rice. I buy the (large) jarred pesto from Costco, it’s nice to have several recipes to use it up. I love how light and flavorful this dish is, Alexis. 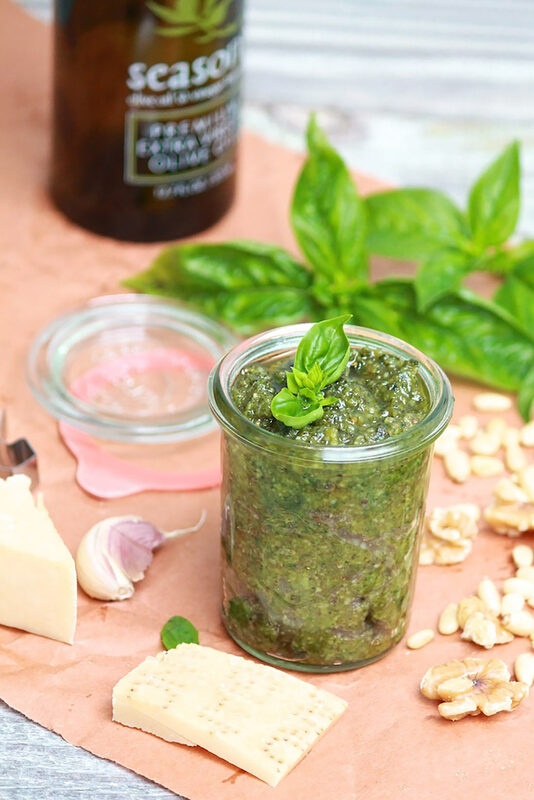 So glad you enjoyed too…and yes, a very good way to help work through a big jar of pesto!